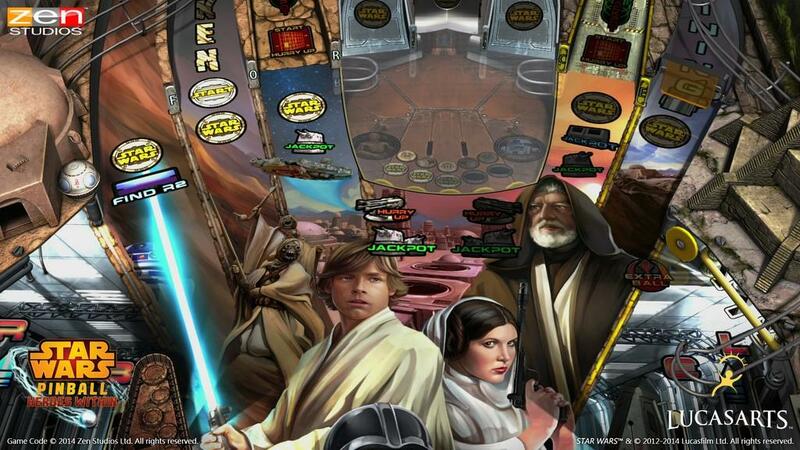 Zen continues to churn out some great tables for their pinball game and if you are a Star Wars fan, that series has been rock solid. Four new tables were launched today and Zen was nice enough to send along all of them to review. The four tables are sold under the Heroes Within subtitle featuring Han Solo, Droids, Jedis, and Episode IV: A New Hope. I’ll start out with what I think is the weakest table of the four. As the title suggests, A New Hope’s theme is the first Star Wars that came out in 1977. I’m not a fan of symmetrical tables and this one is close. There are many ramps in the middle with a few lanes and only two top flippers on the table.Two do sit underneath and some of the mini tables have more flippers though. I’ve always been partial to tables with a few more than two flippers on the main area, something this one doesn’t have. To launch the ball, there’s the blue lightsaber handle that Luke uses when he trains in A New Hope. 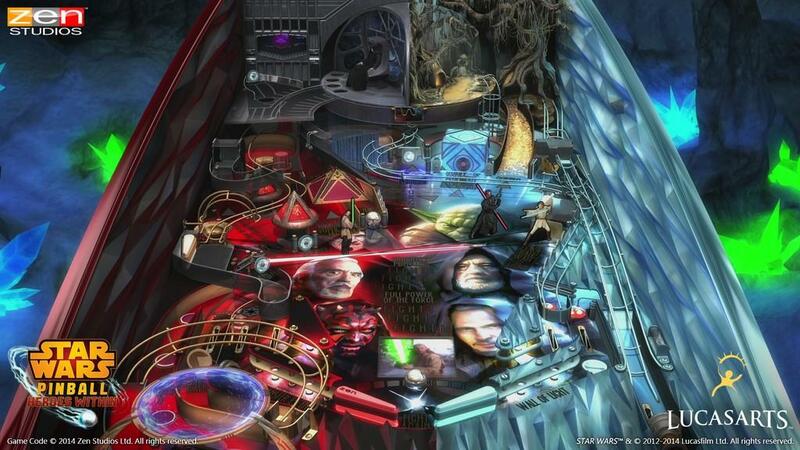 It launches the pinball and is accompanied by the lighting of the saber. I like the nice little touch of the radar that displays the line of sight between the Death Star and Yavin 4 indicating how powerful your launch is. The more power you use, the farther away the Death Star’s aim on Yavin 4. One of the things I do like is that ability to call out your skill shot on the table. You pick the ramp and then try to get the ball up the one you specified. It gives a slightly little bit more control to you, which some people might like rather than the random indicator of what the skillshot will be for that ball. The middle actually changes depending on the scene you want to play out. For example, when choosing to reenact the Death Star trash compactor scene, that area turns into brown water complete with the one eye worm that swims around underneath that you have to hit with pinballs.. 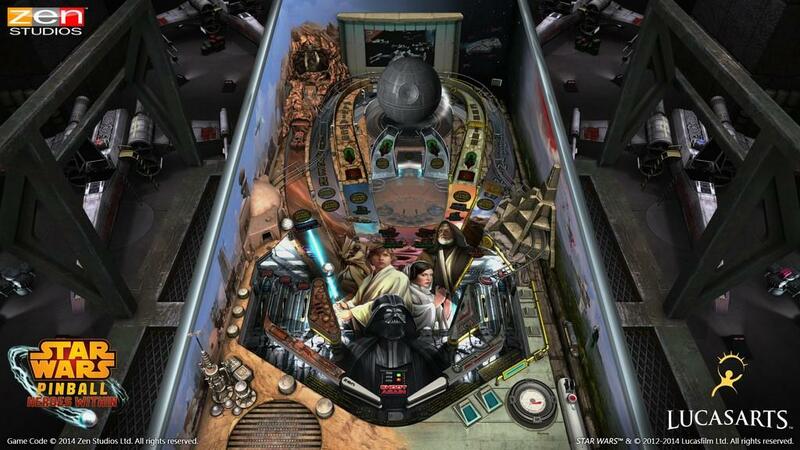 Sometimes a stormtrooper sits in the middle with various characters interacting with it.. Actually one of the better mini games is when the middle changes into a trench run where a mini table lets you hit pinballs against Tie Fighters chasing an Luke in his X-Wing. The amount of animation on this table seems pretty limited compared to Han Solo and Droids tables. Whereas those have a few things going on around, A New Hope’s animation is pretty non-existent until you choose a scene to play out. A New Hope, as you suspect, uses many quotes from Episode IV so I did like hearing the familiar lines from that movie. The voices seem like a mix of original and imitations although some are just way off. The music comprises mostly of the theme song with a sprinkling of other Star Wars orchestral music thrown in there. Of the four, this one was the one that least interested me, which is a little disappointing as it’s the only one that uses a specific movie as its theme. There are one or two nice little mini games, but the table didn’t hold my interest nearly as much. The layout of the table seems the least inspired of the four available and I would categorize this table the weakest of the four. Fans of the great smuggler and his sidekick, this table is for you. Smack dab in the back is a great model of the Millenium Falcon. Above and behind it is the Mos Eisley Cantina where you first meet Han in Episode IV. 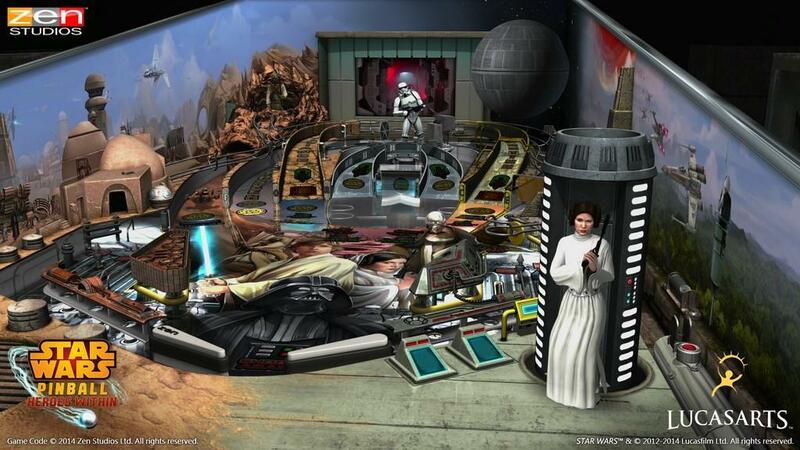 Han himself is sitting in a chair on the bottom right with Chewbacca in the bottom left. C3P0, wrapped up in wires like in Empire Strikes Back, lays in the bottom middle of the table. 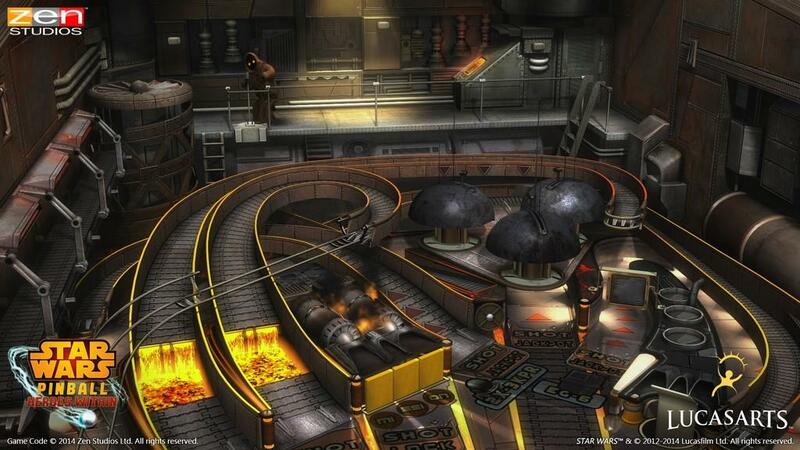 I liked this table’s layout, especially the shooting gallery cantina featuring some of the aliens in the movie. Paper cut outs of various aliens scroll across the back, giving you targets to shoot at. 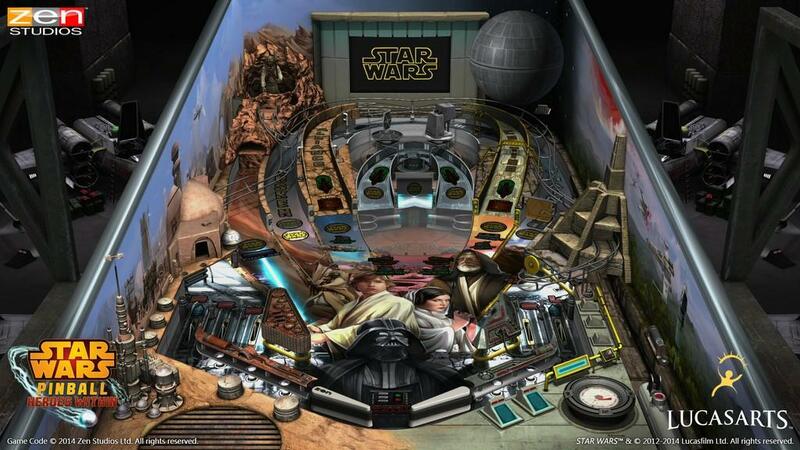 Also, you get to shoot the ball inside the Millenium Falcon as a mini table appears in there with targets and two flippers.The bowcaster and Han’s pistol adorn the top of the bumpers by the flippers. There’s a good variety of ramps throughout the upper half. 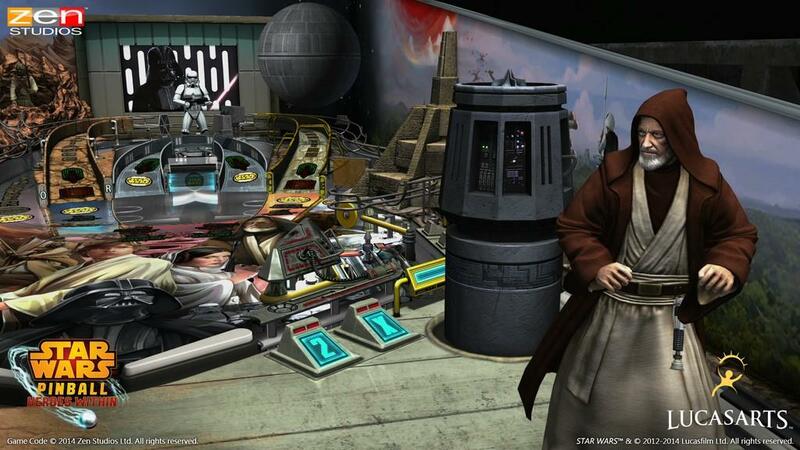 Of course, many famous scenes involving Han are depicted on the table. There’s his infamous carbonite prison on the left side by Chewbacca where he waits to be released. An exogorth holds some captured pinballs on the right side of the table when you can do a successful skill shot. The dot matrix display even shows Han getting his shots blocked by Darth Vader in Empire. There are some great little touches here and there that really make this table a nice tribute to one of the most infamous smugglers of all time. A lot of the lines said in the table sound a lot like Harrison Ford. If it isn’t him saying them, they got someone who’s really close. But, there are certain lines that you could tell a stand in was used. Anthony Daniels, is of course, voicing C3P0 as he seems to always be the one voicing the golden robot when he appears in pretty much anything. The Cantina song plays throughout your time on the table, fitting considering Han’s first appearance. The layout, for the most part, is fun and I consider the Han Solo table to be one of the better ones in the Heroes Within pack. There’s good eye candy throughout and it’s not overly difficult to trigger the various mini games. 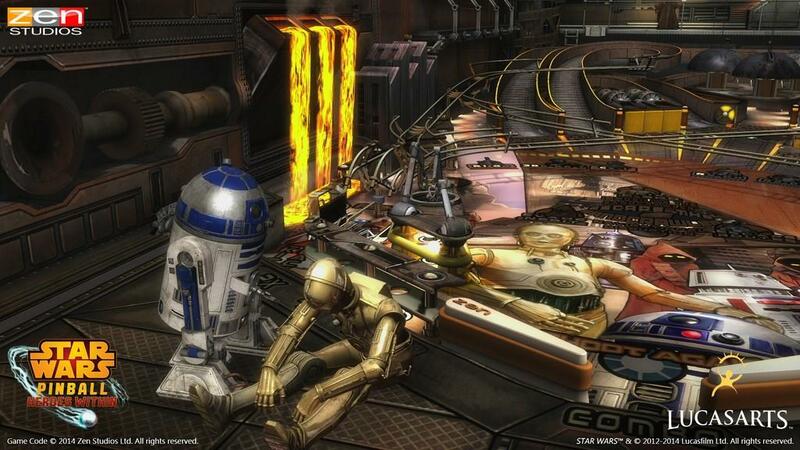 The Droids table feature arguably two of the most famous robots in cinema: R2D2 and C3PO. I really like how the table looks like the inside of a Sandcrawler. It’s like someone took the top off of one and you see the inner workings of the Jawa vehicle. It even looks like it’s moving through the desert of Tatooine as outside of the table shows the sandy ground moving underneath the table. 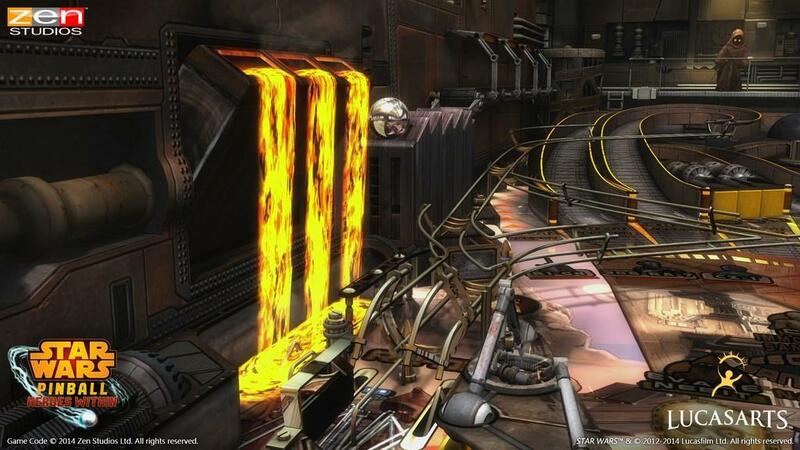 The working gears, hydraulics, and fans complete the illusion. All the ramps, bumpers, and moving aspects of the table have a very industrial design to it. 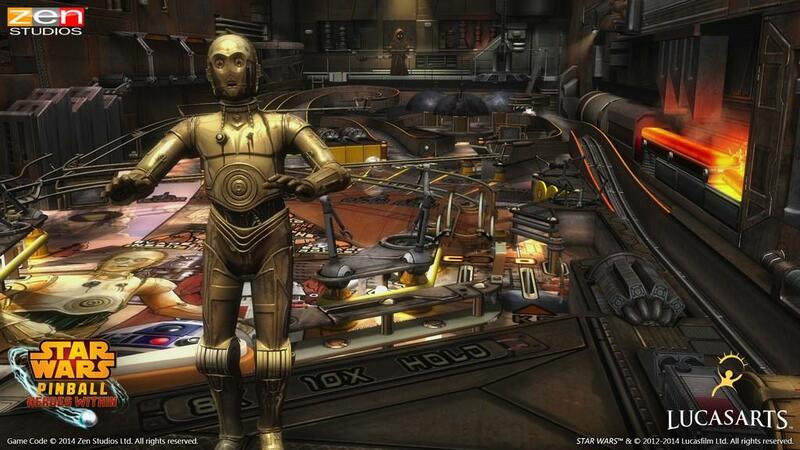 C3P0 hangs out on the bottom right with R2D2 in the bottom left. At the top of the tables stands a Jawa on a platform. On the left side is this nice glowing flow of red out liquid metal, which sometimes appear on some of the ramps. I am a little disappointed they just use the Star Wars theme for this table. I don’t know of a good song to use, but something more akin to the Droid theme I think would have been better. The Droids table is one of the more visually appeal tables with plenty of moving mechanical parts and a nice stylized look to it. There are plenty of eye candy to look at and I was surprised at nice the table looked. The Masters of the Force table is one of my favorites of the set. Focusing on the Sith Lords and Jedi Masters of the films, the table has a great design to it. The table is cut in half with the left side being the Sith and the right side being the Jedi. The left side has mostly reds in its design while blue propagate the right side. This even gets down to the flipper level as each side emits a glow of its designated side color. At the top of the table sits two masters of each side: Darth Sidious and Master Yoda, both in their most famous setting. 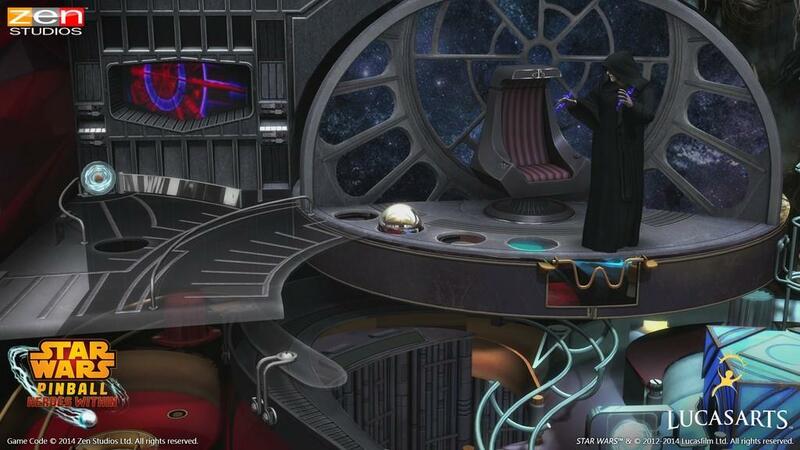 Sidious sits on the throne in the Death Star while Yoda stands on a small recreation of Dagobah. 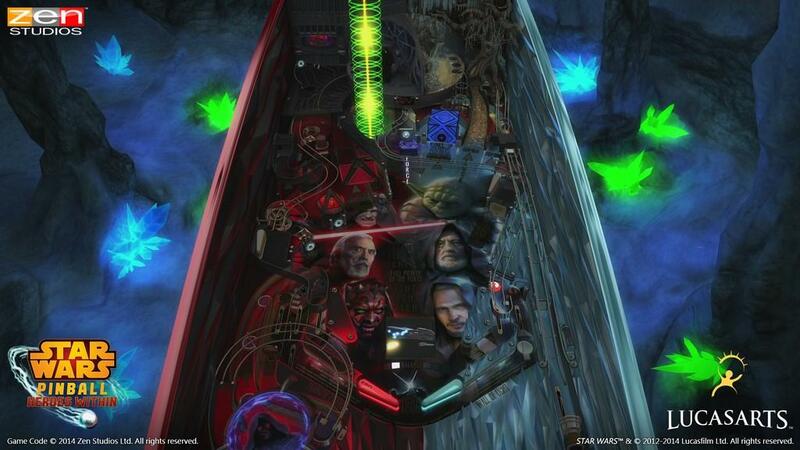 The faces of Obi Wan, Darth Maul, Count Dooku, Qui-Gon, The Emperor, and Yoda stand out in the middle of the table. 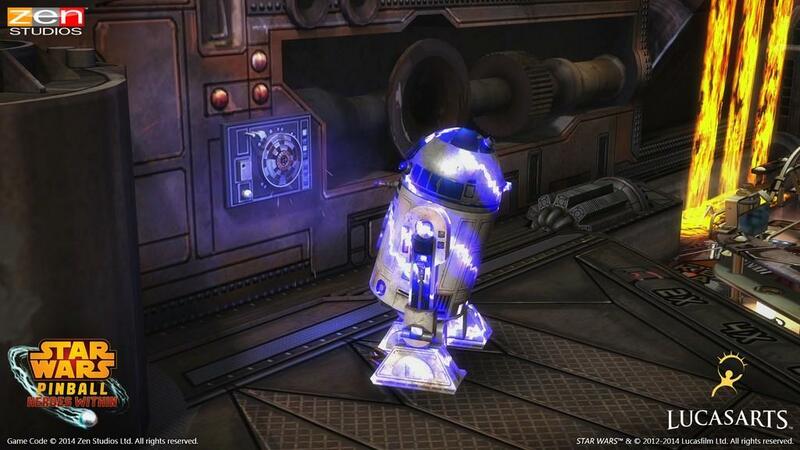 On the right side, a large blue Holocron sits under Yoda and spins around when being hit. When struck on a certain side, the Holocron will capture the ball with a magnet, spin around, and drop the ball into the mini table that slides out from under Yoda and the Emperor. 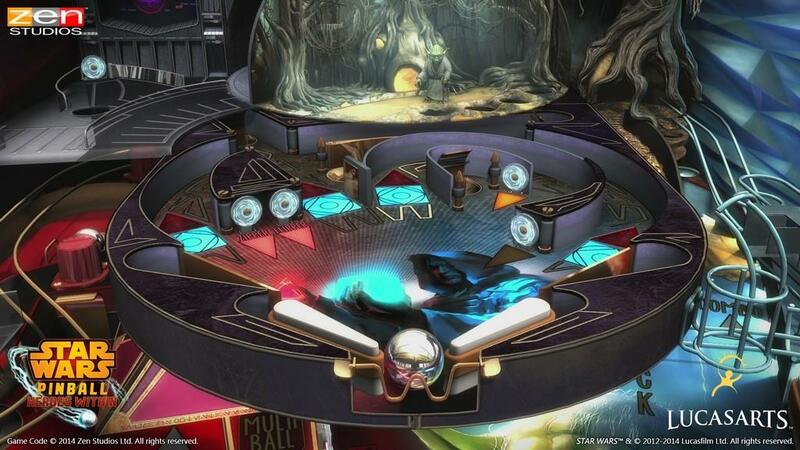 The capturing and moving of the ball is reminiscent of the Theater of Magic pinball game of old, which was pretty cool when you saw it for the first time way back in the day. 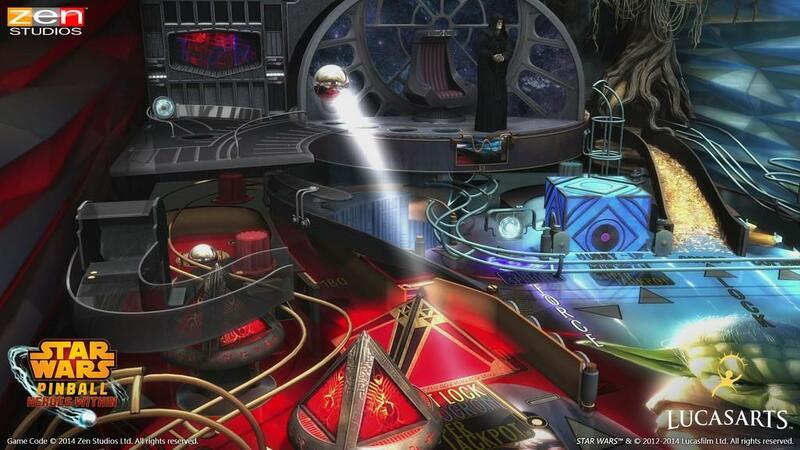 The pyramid shaped Sith Holocrons serve as bumpers on the left side of the table. The ball launcher is the handle of Luke’s green lightsaber. Launching the ball produces the green saber ignition visual and accompanying sound. There aren’t as many ramps on this table, but there are a few lanes on the left and right side. This is more of a target-centric table, but there are enough multi-level areas to give it some variety. One of the more enjoyable aspects of the table are the paper cut out of various characters that appear giving the table a little different feel visually. With a skill shot, you see a small Luke Skywalker paper cut out on the right side of the table. 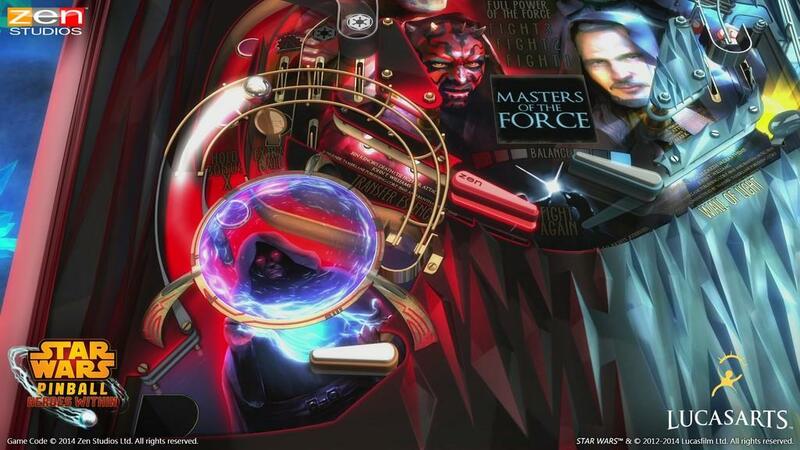 One scenario has little paper cut outs of Obi Wan, Qui-Gon, and Darth Maul sliding back and forth in the middle of the table while you try to hit them with a ball. The two most prominent voices of the table are Darth Sidious and Yoda. You’ll hear a lot of lightsaber swings and clashes as well. Music is mostly the main Star Wars theme as well with this table. Zen’s approach to splitting the table in half made for a fun experience. I really liked how the table flowed and the sort of “battle” between the light and dark side. With the Heroes Within table set, Zen has come out with what I consider three great tables and one so-so table. 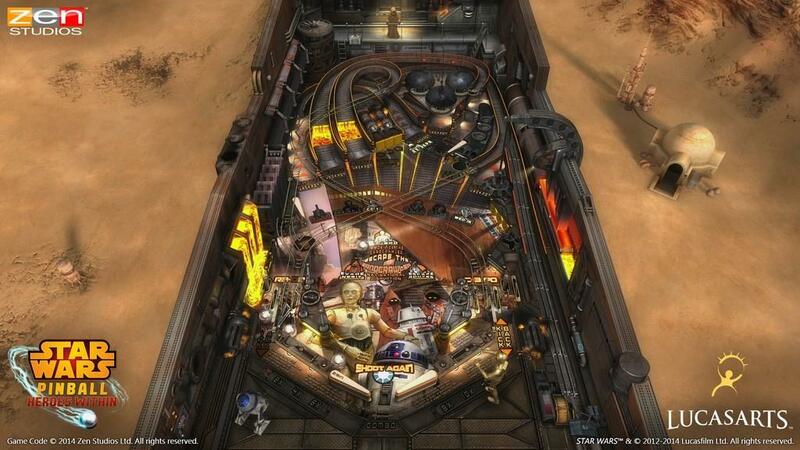 Droids, Han Solo, and Masters of the Force offer some fun Star Wars themed pinball action with great little mini games that remind you of various scenes from the movies. A New Hope is OK, but I found myself not playing this table nearly as long as the other three. Something that’s nice though is you get four tables for the price of three. The DLC is the same price as the previous Star Wars set that contained three tables. 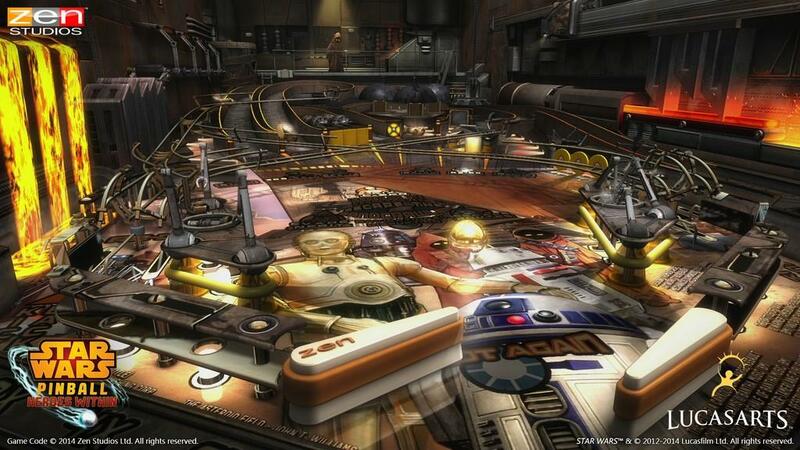 Even if you aren’t a Star Wars fan, the tables are pretty fun to play. Those that enjoy the movies will get an extra kick out of the familiar sounds, dialogue, and scene mimicking mini games that Heroes Within offers.